Greater Charlotte’s Action Network- RISE Together NC — Greater CAN has focused on Community Development and Outreach. 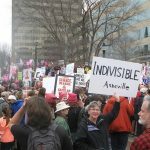 Indivisible Asheville and Western North Carolina -We have formed a local action hub to get community members in Asheville and Western North Carolina involved in the political process. Indivisible NC MoC District 9 — This is a local group offering connection to events and resources which resist the current administration’s agenda, through organization, education and peaceful activism. Indivisible groups around the country. Indivisible North Carolina Resist Trump’s agenda. We believe Trump’s agenda is racist, authoritarian, and corrupt, and it must be stopped. Focus on local, defensive congressional advocacy. We demand that our own local Members of Congress serve as our voice in Washington, DC. The Resistance In Gaston County — If you have ever considered yourself a Rebel against the Empire, a member of Dumbledore’s Army or the XMEN, or followed the Mockingjay, then join us as we conspire to resist the new assault on women, immigrants, LGBTQ, African Americans, and other marginalized groups.